01/31/2014 - Battle of The Bands! 01/09/2014 - Part Time Position Opening! 12/03/2013 - Christmas Music is Here! Due to space limitations, Mamaroneck does not offer lessons. 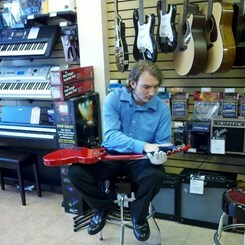 Please check our locations directory for another store near you which may offer lessons. Here at Music & Arts, music is our top passion and priority. That’s why for over 65 years it’s been our mission to get people of every age and walk of life excited about the art form we love. 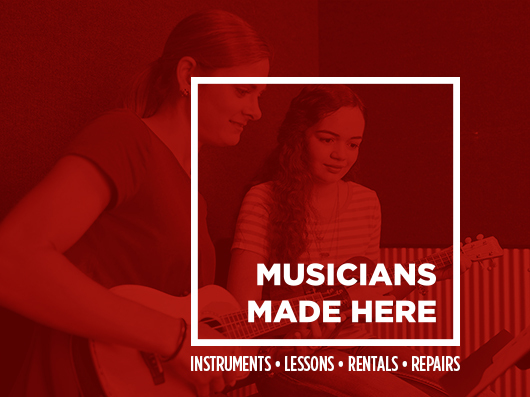 From name brand instrument sales, rentals and repairs to an incredible offering of private and group lessons, we’re proud to be America’s most trusted one-stop music shop. We’re happy to be a musical resource for everyone from professional musicians and educators to the parents of students learning about music for the very first time. So no matter who you are, you’ll always have a home here at Music & Arts! 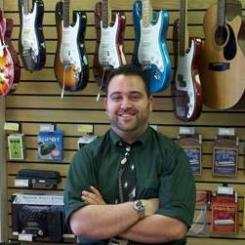 Mamaroneck, New York, we’re here for all your musical needs! We’re conveniently located on the northwest intersection of Waverly Avenue and Mamaroneck Avenue just east of 1-95. You can find us just a short walk away from the Sheldrake River and Columbus Park. We’re proud to serve the incredible community here in Mamaroneck and the surrounding areas of Larchmont, Rye, Mt Vernon, New Rochelle, Bronxville, Tuckahoe, Hartsdale, Scarsdale, Harrison, Rye Brook, Eastchester, White Plains, Ardsley, Woodsdale, Port Chester, Valhalla, Greenwich and more! Ardsley, Armonk, Bedford Hills, Chappaqua, Dobbs Ferry, Eastchester, Greenburgh, Harrison, Irvington, Katonah, Mamaroneck, Mt. Kisco, Mt. Vernon, New Rochelle, Pelham, Pleasantville, Port Chester, Rye, Rye Neck, Scarsdale, Somers, Tuckahoe, Valhalla, White Plains, and all Private Schools including parts of Greenwich, CT.
Did you know that Gary Young, drummer of the seminal alternative rock band Pavement, is from here in Mamaroneck? If you’re interested in making some groundbreaking music yourself, check out our private lessons! Whether you’re looking for great lessons for your kids or help with an instrument you’ve been playing for years, we can help! Our background-checked and university-trained instructors have experience teaching technique, theory and songwriting on a variety of instruments, so we’re here to help no matter what your goals in music are! Our group lessons are the perfect option for social learners. These lessons are a terrific way for friends, families and coworkers to bond and learn a new instrument at the same time. Students typically learn as much from each other than they do from their instructor in these lessons, so this is a great option for extroverts. Gearing up for a huge show at the Emelin Theater? Whether you play flute in a chamber ensemble or the bass guitar in a punk outfit, let the Music & Arts here in Mamaroneck be your last stop before you take the stage! With a massive selection of name brand instruments, music accessories, books and sheet music, we’re here to help you shine on stage. Break a leg up there! What humbly began in a Bethesda, Maryland home back in 1952 has now become the nation’s leading provider of instrument sales, rentals, repairs and private lessons. A lot has changed over the past 65 years, but we’ve never lost sight of our values and music’s profound impact on a personal level. Owned and operated by the same family since the very beginning, our focus remains on the many communities we serve across the nation. Come visit us at our Mamaroneck location today! We can’t wait to meet you!